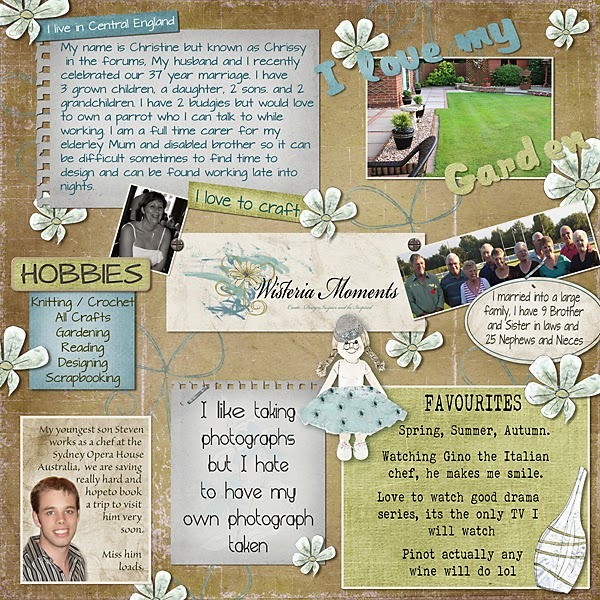 MyMemories Blog: Meet Today's Daily Designer.....Wisteria Moments! Meet Today's Daily Designer.....Wisteria Moments! Hello, my name is Christine mostly I am known as Chrissy online, I am mom to three and I have 2 grandchildren. I have been married for 37 years and inherited a huge family by marriage which just grows bigger every year, I have 9 brother and sister in laws 25 nephews and nieces who all now have their own children but I have lost count of how many there are. So you can imagine there is always some kind of family celebration to attend, birthdays, anniversaries and lots of weddings. I started designing about 3 to 4 years ago, originally I was making wedding favours, cards and stationery alongside lots of other crafts such as knitting, crochet and sewing. My first connection with digital scrapbooking came while searching online on how to make my own papers in Photoshop. I had recently bought a new PC which came with a full free version of PSE and I had no idea how to use it, but I thought it would be a good idea to print my own papers for card making to bring down the cost of my card making. I very quickly became addicted to Digi scrapbooking and designing. I love working as a designer and fits in with my family life just perfect being a full time carer for my Mom and disabled brother I am now able to work from home. My main goal at the moment is to save enough to take a visit to Australia to visit my youngest Son who has been working at Sydney Opera house now for the last 18 months and it looks like he will be there for several more years, cannot wait to visit him but I just don’t know how I will cope with the flight, my longest so far has been 8 hours and I only just about got through that one lol. Just hope I can save enough very soon as I have made some fabulous online friends in Australia too and it would be fantastic to maybe meet some of those friends while we there.